There’s no disputing the unexpected rise in popularity of the social networking site Pinterest since the beginning of this year. It’s quickly become one of the most widely used social sites on the internet, rising into the ranks of Facebook, Twitter, and LinkedIn. Perhaps the most exciting aspect about the tool is its focus on content. When users visit the website, they arrive into their pin feed. This feed focuses solely on the images and videos that people they follow share. Unlike other social networking sites, Pinterest keeps the focus on the images and videos themselves rather than the person sharing it. Anything you share on Facebook, Twitter, or LinkedIn is first tied to your name. Pinterest, instead, displays the content you share first, then displays who shares it. This makes for a great way to meet new people who really appreciate what you share because they share the same interests as you- not necessarily because of who you are. This is especially important when it comes to brands who use Pinterest in their marketing. What does all of this mean? It means that Pinterest is perfect for brands. Consumers have become numb to most advertising because brands have forced non-targeted ads to them. The result is wasted advertising spend and consumer resentment towards advertising as a whole. Pinterest can solve this problem because it’s solely about content. More specifically, it’s about content that users are interested in. Lets pretend you’re a home and garden brand. 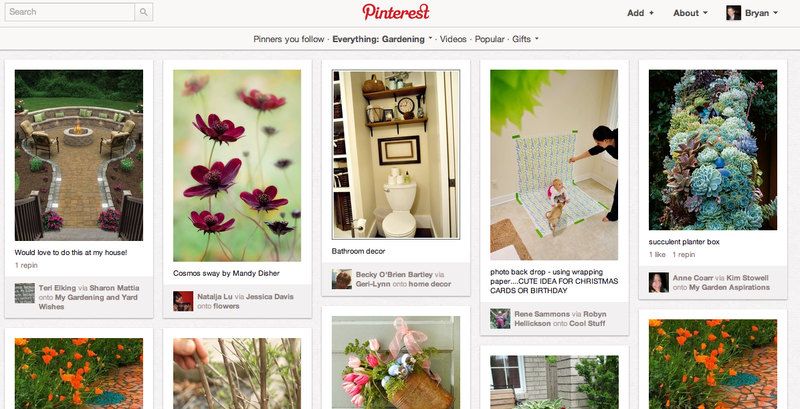 You create a profile on Pinterest and categorizing you boards as containing “garden” content. 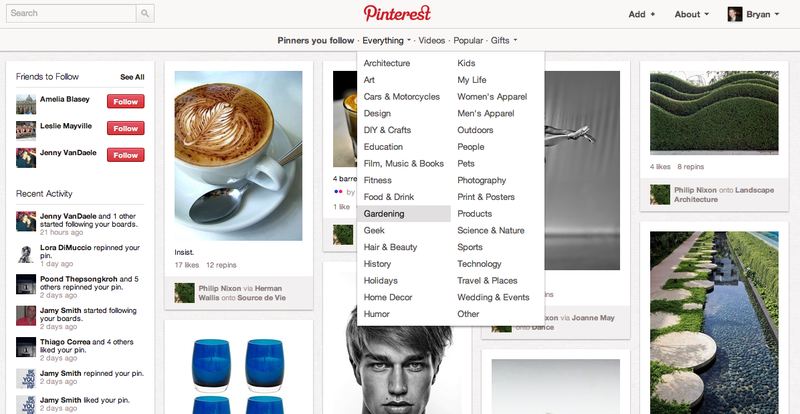 As a result, whatever you pin lands into the Garden section of Pinterest. Anyone looking at the pins on the section will see your pins. If they find your pins interesting, they might like, comment on, or reshare your pin. They may even begin following your boards.This means that whenever they log into their Pinterest account and go to their homepage, they’ll see your pins. For content you’ve pinned from your site, if users click on your pins, they’ll be taken to your website and possibly convert to a sale. Even if you don’t have an e-commerce site, they’ll still make note of your offering and look for your products or services in a local store. Furthermore, they may even repin your content for all of their followers to see. This is where earned media comes into play and can make Pinterest a true winner for businesses. By placing emphasis on content, Pinterest creates the perfect environment for brands. Since the content ties back to the brand, brand awareness increases and the content becomes a subtle advertisement and opens up a conversation between the brand and the consumer. Recent studies have shown that Pinterest is now bigger for brands than Google+ and Tumblr. According to AddThis, referral traffic from Pinterest was 30% higher than that from Twitter. Additionally, the number of people following brands on Pinterest increased 26% in June, signaling the importance of making a presence on the social media site. For tips on how to use Pinterest for your brand, please click here.